Follow these steps to reset the Epson Stylus Office T40W printer. 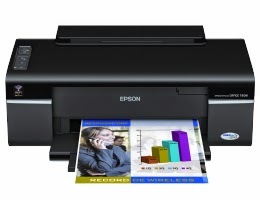 The Epson Stylus Office T40Wprinter is a multifunction printer with wireless connectivity and individual Epson cartridges, compatible with Windows® 2000, XP, XP Professional x64 Edition and Windows Vista ™ USB Macintosh® OS X Macintosh OS 10.3.9, 10.4.x, 10.5.x supports paper sizes 10 x 15 cm (4 x 6 in.) 20 x 25 cm (8 x 10 in. ), letter, Legal (21.6 cm x 35,6cm), A4, A5, A6, B5. The cartridges compatible with this printer are T103120 / T103220 / T103320 / T103420. If you are looking for ink cartridge number compatible with this printer it is the Epson 103 ink cartridge (Cyan, magenta, yellow and black). Before starting the reset process, we have to make sure no other printer is connected to the computer and the printer and computer are ON and connected to each other. After downloading the file, you will need to decompress it by using Winrar to see how to perform a decompression you can check the following instruction see image below. After decompressing the file, double-click on the program file that has shown on the following image. 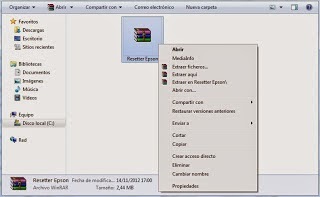 Run the file by double-clicking on the right mouse button. A message will let you know that the program is free, just click on ACCEPT. Next, a window will appear you will have to select the port, click on AUTO SELECT option and click OK see image below. In model name, the name of the printer we are trying to reset will appear, and then leave Destination as shown and for the port leave the default AUTO SELECTION. After clicking OK, the window with auto selection will disappear and the main program Window will stay in place then you will need to select the option Particular Adjustment Mode. view image. In this steps, you have to be very careful and select the right option mentioned. Selecting the wrong option can seriously damage your printer by deleting the configuration. Select the Waste Ink Pad Counter and click on OK to continue. This option will completely reset the printing pads of your printer as brand new. Click on CHECK to verify that everything is working perfectly, click on SET and then on INITIALIZATION. When the process is complete click on FINISH, turn the printer OFF wait about 30 seconds and turn it back ON the page counter will be resumed check the image below. Leave us a comment in the section below if you have any question and we will be glad to assist you as soon as possible. You can also download the printer drivers for Windows XP / Vista / 7, get a free manual for this printer (HTML) with this we can read printer factory specifications.